A Two:Dot poster designed by Dennis Shives. When Dean and JoAnne Thompson built themselves a home in the East End back in 1954, they made the news with their choice of material. Rather than put up a standard suburban ranch house, they hired a contractor to mix mud and straw into large blocks, bake them in the sun and truck them to an isolated lot near the end of Hendrickson Road. There, the blocks were assembled into a handsome, Mission-style ranch house, complete with a two-car garage and a workshop for Dean to putter around in. The Ojai Valley News considered this structure so unusual that they ran a story about its construction. But after that auspicious debut, the house subsided into anonymity. No one took much notice, a few years later, when Dean converted his workshop and part of the garage into a homemade recording studio. The Thompsons raised three sons in the house, then sold it in 1976 and moved to Santa Barbara. In 1983 the house passed into the possession of its current owners: Darrell Jones, an engineer, and Glenda Jones, a painter who taught at Topa Topa Elementary School. The Joneses knew nothing of the house’s history. Then one day their friend Dennis Shives brought over an old record album, Milton Kelley’s “Home Brew,” and told them it had been recorded in their garage. Shives these days is an artist, but in 1970 he was primarily a musician, and he had played harmonica on the Kelley album. The best players in town regularly found their way to the Thompsons’ Two:Dot Recording Studio to cut their teeth as recording artists. Alas, none of the records they made there became hits. The little studio closed its doors when the Thompsons moved to Santa Barbara, and over the years it faded into oblivion — until the advent of the Internet, where time stands still, and nothing is lost forever. These days, a copy of “Home Brew” that’s still in decent shape will go for hundreds of dollars on eBay — and a sealed, never-played copy might fetch $3,500. And “Home Brew” is not even the most sought-after Two:Dot recording. The long-vanished studio is barely remembered in Ojai, but it’s now world famous among collectors of obscure rock albums from the ’60s and early ’70s. Cultish websites make gushing references to the “legendary” Two:Dot, that mythical place where “mega-rare” albums like “Hendrickson Road House” were created. Enthusiasts in Europe and Japan will offer big bucks for vinyl rarities recorded in that converted garage — albums hardly anyone bought when they first came out. As long as a record can plausibly be categorized as “psych” or “psych-folk” — short for “psychedelic folk rock” — people will line up to bid for it. This is the story of Two:Dot’s heyday, and its unlikely afterlife as a holy grail for record collectors. It’s set against the background of Ojai’s extraordinarily vibrant music scene during the Two:Dot era, which largely overlapped the psychedelic ’60s era. This was a time when several big-time rock stars came to Ojai and mixed easily with little-known local players, some of who would go on to bigger and better things. Two:Dot was a vital component of that scene. There were plenty of bars and clubs in the valley where bands could play live sets, but there was only one place in town to cut a record: Dean Thompson’s funky little adobe-walled studio in the middle of an orange grove, near the end of Hendrickson Road. Dean and JoAnne first met at the University of Redlands around 1950. She was a voice major; he was a physics major with a minor in math. Together, they added up to something. By 1951 they had married and settled on Drown Street in Ojai, where Dean started work that September as the science teacher at Nordhoff High School. Five years later, Dean left Nordhoff to work for a neighbor, Lee Appleman, who had started an electronics business called Topatron. By then, the Thompsons had built their adobe house on Hendrickson Road, a private road that runs east from McNell Road to the top of a hill offering splendid views of Sulphur Mountain. Their three sons, Kenneth, Bryan and David, attended the nearby Monica Ros School. Their neighbors included the movie star Anthony Quinn. In the late ’50s, Appleman moved Topatron to Garden Grove. Dean soon tired of the long commute. He decided to stay in Ojai and turn his recording hobby into a full-time career. For the name of his new venture, he reached back to his college days, when he and his friend Tom Oglesby had talked about starting a business someday and calling it Two:Dot, for their initials: Tom W. Oglesby and Dean O. Thompson. Years later, Dean revived the name for his Ojai recording studio. It appealed to his quirky sense of humor. JoAnne handled the office duties, and Dean was the engineer. They did not initially set out to record rock ‘n’ roll acts. Two:Dot’s bread and butter was souvenir albums for church choirs, student chorales (including Nordhoff’s Gold ‘n’ Blue Singers) and high school musicals. (One album still in JoAnne’s collection is a Santa Barbara Youth Theatre production of “West Side Story” featuring Eduardo Villa, who currently makes his living as a tenor at New York’s Metropolitan Opera.) But in the mid ’60s, with the advent of the Beatles, the market for rock music grew exponentially. Suddenly, newly formed groups were crawling out of the woodwork, and they all dreamed of signing a record deal with a major label. These groups represented a potential bonanza for Two:Dot — and for Dean’s new friend Tom Lubin. Lubin was a Santa Barbara City College student, a part-time radio DJ and a would-be music mogul, affiliated with a fledgling Santa Barbara label called Jet Set International. He already had produced a single by a local band called the Calliope, which had received some regional airplay and sold a few thousand copies. Now, Lubin was looking for a place to record Jet Set’s other acts, the folk singer Don Robertson and a garage-rock band called Blue Wood. But Jet Set was a shoestring operation, and studio time in L.A. was expensive. Somewhere, possibly at the radio station, Lubin heard about a little studio in Ojai with a decent 4-track tape recorder and reasonable rates. The studio looked primitive, but it was fully functional, and the price was right. Lubin produced a Blue Wood single (“Turn Around” backed with “Happy Jack Mine”) and a Don Robertson album, “Yesterdays Rain” (sic). Neither record took off, but there were plenty of other musicians in the region who were eager to take their shot at success. Dean decided to place a bet on the rock ‘n’ roll boom. Dean’s next move was to have Lubin record a demo album, to show what Two:Dot and its 8-track could do. Lubin recruited some musician friends from L.A., and they set to work writing songs. It was now late July of 1967, the midway point of the Summer of Love. “Sgt. Pepper” was dominating the airwaves, and flower power was in full bloom. In downtown Ojai, hundreds of hippies spent that summer cavorting in the park, where they clashed with local rednecks, sometimes violently. But all was peaceful out on Hendrickson Road. Lubin and his friends commuted to Ojai every Friday evening and spent the weekend in the studio laying down tracks. They called themselves Prufrock. By year’s end they had completed an impressive-sounding album that echoed all the psychedelic sounds emanating from San Francisco and Los Angeles. Then they disbanded and went their separate ways. Two:Dot never pressed any vinyl copies of the Prufrock record — it existed only on acetate. But it had served its intended purpose, by showing what an ambitious band could achieve at Two:Dot. Installing the 8-track did not automatically vault Two:Dot into the big time. The Thompsons’ approach to marketing leaned heavily on word of mouth, so it took a while to build a regional reputation. Others were undeniably talented. There was for example Dennis Shives, who played harmonica on Ronny Bowdon’s 1968 EP “Portrait of a Gambler,” recorded on Hendrickson Road. 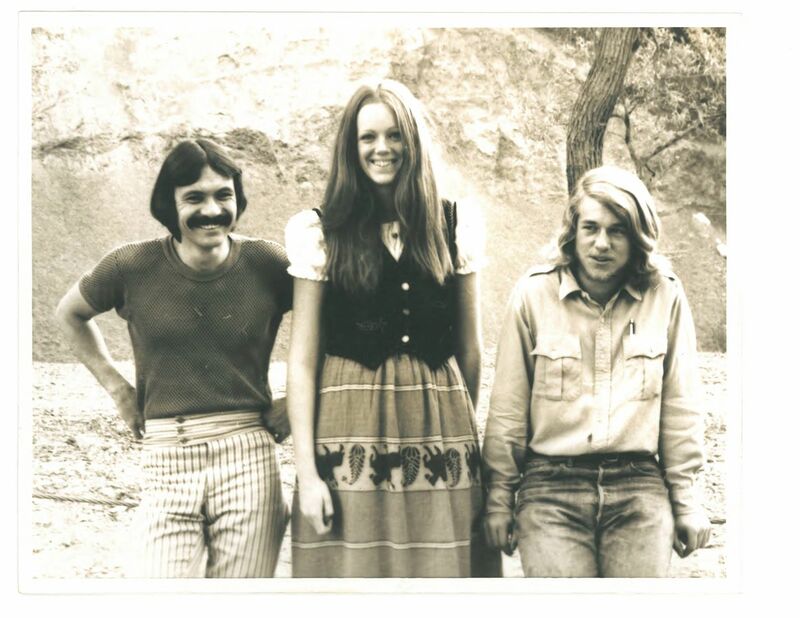 Another Two:Dot discovery was Ojai guitar whiz Martin Young, who was only 16 in 1969 when he recorded an album called “Take One” with local singer Sally Magill. Young played most of the instruments himself. Two:Dot was not a full-fledged label; it was more akin to a vanity press. Dean generally ordered only as many album copies as the recording artist was willing to pay for. “The majority of the people who came to us used to sell them to their friends,” JoAnne says. Some Two:Dot clients were more ambitious — they hoped to use their albums as demos to market themselves to major labels. Many of these demo albums were recorded with local musicians serving as session players. Dean paid these musicians with free studio time, which they could devote to their own projects. For homegrown Ojai players like Martin Young and his fellow guitar virtuoso Raj Rathor, Two:Dot’s unlikely presence in their tiny little town was an enormous stroke of luck. Bryan Thompson, Martin Young, Milton Kelley, JoAnne Thompson, Jeff Hanson and Alan Thornhill, on a recent visit to the old Two:Dot garage studio site on Hendrickson Road. Photo credit: Caitlin Petersen. Dean had no shortage of session players to call upon, because Ojai by the late ’60s had developed a thriving music scene. The homegrown talent was augmented by L.A. transplants like John Orvis, who moved up here from Venice in 1969. Orvis would strap a Pignose battery-powered amplifier on his back, plug in his left-handed guitar, and wander around the Arcade, serenading passersby with tasty blues licks. Nor was Orvis the only live-music option in town. “You could go hear live music at six or seven places on a Friday night,” Shives recalls. He played harmonica with the Ojai All-Stars, which had a regular gig at the Ojai Club, a rowdy downtown bar located where Ojai Pizza is today. “There was also the Oaks, the Cactus Club, the Sand Dollar, the bowling alley, the Firebird, the Deer Lodge and the Wheel — all had live music,” Shives says. Libbey Bowl was another popular venue for local musicians. It was there, early in the summer of 1970, that Dean Thompson met Milton Kelley. Kelley was a singer-songwriter who had grown up in Ojai and was now back in town after serving a tour in Vietnam. He was part of the musical line-up at the bowl that day, and Dean liked what he heard. The result of that conversation was “Milton Kelley’s Home Brew,” released on the Two:Dot label. The backing musicians included Martin Young on guitar, Poi Purl on “jangle piano,” Ronny Bowdon on “bongo-congas” and Dennis Shives on harmonica. Dean was the engineer and the genial host. Kelley’s friend Dan Cole had some recording experience — he had played drums for the Raiders, an early ’60s Ojai group that had once cut a single in a Hollywood studio. Cole ended up producing Kelley’s album. “I listened to a bunch of his songs and we picked, like, 13 of them,” Cole says. “We printed 400 LPs and sold every one,” Kelley says. Meanwhile, Dean was back in the studio recording another promising singer-songwriter, 19-year-old Sue Akins. She had grown up in Ventura but left home at 17, venturing north to Haight-Ashbury, the hippie mecca in San Francisco, before returning to Ventura County. By 1968 she had landed in Ojai, where she was living in the Cottages Among the Flowers on West Aliso Street, and working as a dishwasher at the Gables. She had written a couple of songs that had impressed her friend and neighbor Phil Wilson, with whom she played music occasionally. As it happens, Wilson also played bass with a local trio, which had arranged to cut an audition tape at Two:Dot. During that recording session, Phil told Dean Thompson about his talented friend Sue, the teen-age troubadour who might be the next Laura Nyro. Dean offered to produce an album for Randall. The backing musicians for these sessions included Wilson on bass, Norman Lowe on guitar and Don Mendro on piano and drums. “At first we recorded tracks with the group, whichever group was on board,” Randall says. “Later, Dean and I would do the solo material, songs I wrote for guitar and piano, autoharp and multiple voices. This is where Dean and I came together. Dean owned the candy store and he was letting me run through it, hog-wild, tasting all the wares, letting me use whatever I wanted. The album, “Hendrickson Road House,” came out in December 1970. Randall cannot recall exactly how many copies were pressed, but she thinks it was probably 200. She formed a group called Hendrickson Road House, with Phil Wilson on bass and Martin Young on guitar, and they promoted the album at their shows. Eventually the last copy was distributed, and no more were ever pressed. As the ’60s turned into the ’70s, country rock began to supplant psychedelic rock, as musicians exchanged their Nehru jackets for fringed buckskin vests. Yet the early ’70s still counts as part of “the Sixties” — the era rather than the decade. The “cosmic cowboy” phase of the Sixties had kicked in, with Laurel Canyon as its epicenter. The music business was still booming, especially in Hollywood, where A&R men, the gatekeepers, reigned supreme. At the other end of the industry food chain, Two:Dot continued to record anyone who could pay for a session, and a few who couldn’t. Daniel Protheroe, who had played bass with the Calliope, did some session work at Two:Dot from time to time. One day, he asked Dean for a full-time staff job. Dean hired him and immediately left town on vacation, leaving Protheroe in charge of recording a single called “Love is an Animal,” by a man from the Santa Ynez area who owned a menagerie. Clients like this were strictly small-time, but Two:Dot seemed poised for bigger things. Especially when several prominent television actors who lived in the valley began coming to the studio to cut demos. One was the actor and country singer Sheb Wooley, of “Rawhide” fame, who had topped the pop charts in 1958 with his novelty hit “The Purple People Eater.” Another was James Brolin of “Marcus Welby, M.D.” Then there was Michael Parks, the star of “Then Came Bronson,” who was living on Foothill Road. Parks was also a singer, and he was scheduled to do an album for Warner Bros. He decided to record it on Hendrickson Road. It was to be produced by another Ojai resident of the time, the folk-rock pioneer Jim Hendricks. With this big-time project in view, Dean decided to splurge on another studio expansion. “So we ordered a 16-track tape recorder, and away we went,” Protheroe says. Unfortunately, the Parks-Hendricks project fizzled. Protheroe did record some demos with Hendricks and the legendary songwriter and producer Van Dyke Parks (with Martin Young on guitar), but those sessions never resulted in an album. Still, the new 16-track machine did enhance Two:Dot’s regional reputation. Another unknown singer who recorded at Two:Dot in those days was Eddie Mahoney, who fronted a Berkeley rock group called the Rockets. Mahoney’s Two:Dot connection was Tom Lubin, who by this point was working for CBS Records in San Francisco. Lubin had taken on the Rockets as a personal project. Pleased with the results of these sessions, Lubin took the tapes to his colleagues at CBS. To his chagrin, they declined to sign the Rockets, and the band soon broke up. But Eddie Mahoney did not disappear into obscurity. “Eddie took the tapes to Bill Graham, changed his name to Eddie Money, and a couple of years later was signed to CBS,” Lubin says. As Eddie Money, the singer would score big hits like “Baby Hold On” and “Take Me Home Tonight.” But in 1972 he was just another unknown rock ‘n’ roller who trekked to the Ojai boondocks to make a demo, hoping it would be his ticket to the big time. There were many more like him. Two:Dot continued to record church choirs, student chorales and school musicals, but it was the would-be rock stars who really kept things humming at the studio during the early to mid ’70s. “We were cranking out a lot of work in those days,” Hanson says. One of those local bands was the Country Z Men, whose lead vocalist, Alan Thornhill, had moved to Ojai in 1973. Other Z Men included Martin Young and Jim Monahan, with George Hawkins on bass and Todd Nelson on drums. The group did session work at Two:Dot and cut some demos of their own. “We never released any of it,” Thornhill says. “We played there six nights a week, and that place was full every night,” Thornhill says. The Ojai scene was still going strong, and not just at the Sand Dollar. Glenda Jones, who was living in Ventura at the time, remembers driving up Highway 33 to hear live music at the Oaks, in its pre-spa phase. “Everybody in the county used to come up and dance at the Oaks,” she says. Ojai in this period resembled a northern outpost of Laurel Canyon. At least one full-fledged rock star of the era became a full-time resident: Jimmy Messina, who in 1972 bought himself a ranch on Creek Road. His musical partner Kenny Loggins was a frequent Ojai visitor who for awhile maintained a pied a terre in the old motor court on Mallory Way. Loggins in particular was willing to befriend the local musicians and hang out with them. He would come to the Sand Dollar to see the Country Z Men, and sometimes join them on stage. “He sat in with us a couple of times,” Thornhill says. Naturally, those demos were cut at Two:Dot, still the only recording studio in town. Loggins & Messina did not cut any tracks there as a band — they recorded at Messina’s ranch, using a remote truck they brought up from Hollywood. But the two stars did visit Two:Dot together from time to time to check their mixes on Dean’s equipment. Another Two:Dot visitor and Sand Dollar regular was a strikingly beautiful Ojai Valley School student named Rae Dawn Chong, the future film actress (and the daughter of Tommy Chong of “Cheech and Chong” fame). Chong was a big fan of the Country Z Men. Chong also made the scene at Two:Dot, at least when the Z Men were in session. Hawkins left the Z Men in 1976 to join Loggins & Messina on their farewell tour. “His life changed overnight,” Larold Rebhun recalls, as Hawkins went on to play bass with a long list of hall-of-fame rock stars over the years. Ojai’s Loggins & Messina era also was pivotal for Alan Thornhill, who co-wrote a song with Kenny Loggins and Martin Young, and made connections that led to some big-time gigs, such playing guitar in Hoyt Axton’s band. Young went on to play in Clint Black’s band for many years. The Country Z Men never released a record as a group, but they went on to successful individual careers, helped along the way to some degree by connections originally made through Kenny Loggins and Jim Messina. “It was really a big thing for us,” Thornhill says. It was less of a big thing for Dean Thompson, since Loggins & Messina as a group never recorded anything in his studio. But in 1974, another well-known rock group did come to Hendrickson Road to cut an album. And these sessions would yield the only hit song ever recorded at Two:Dot. Dr. Hook and the Medicine Show had scored big hits in 1972 with “Sylvia’s Mother” and “The Cover of the Rolling Stone.” But their follow-up singles all flopped, and two years later they were broke. “We recorded a lot of the ‘Bankrupt’ album in Ojai, including the hit single ‘Only 16,’ which was a cover of the old Sam Cooke song,” says the former Dr. Hook vocalist Dennis Locorriere. “Bankrupt” came out on Capitol Records in 1975, and “Only 16” topped out at No. 6 on the Billboard singles charts in January 1976, with Locorriere on lead vocal. Two:Dot finally had produced an actual hit: “Only 16” soon was certified as a gold record. But already the little studio’s days were numbered. By this point, the trippy ’60s era finally had expired, and “the Seventies” were in full swing. Rock music was now a serious business, and there was a limit to what Dean and JoAnne Thompson could accomplish in a converted garage in a tiny town in the middle of nowhere. They decided to move to a bigger market and open a much bigger recording studio. In March 1976, they sold the house on Hendrickson Road and moved to Santa Barbara. Dennis Shives makes a similar point: The Santa Barbara operation was vastly bigger and better than Two:Dot had been, but perhaps less satisfying to run. By 1990, Dean had sold Santa Barbara Sound and gone on to other things. He died in 1996, at the age of 70. The old Two:Dot crowd was well represented at his memorial service. But Two:Dot’s physical legacy — the actual recordings — seemed destined for the scrapheap. In fact, that’s precisely where many of them ended up. Some years after the move to Santa Barbara, Dean made a good-faith effort to locate everyone who had ever recorded anything on Hendrickson Road. The people he was able to locate were offered the master tapes of their sessions. “The others eventually were tossed,” JoAnne says. So that was that. Except that it wasn’t. Even before Dean died, old Two:Dot albums were popping up in unexpected places, especially in the record collections of people who were fascinated by late ’60s psychedelia. One such collector was Raymond Dumont, who lives in Buchs, an Ojai-sized town near Zurich in Switzerland. Dumont makes a specialty of reissuing obscure late ’60s albums on vinyl through his own label, RD Records. In the early ’90s, he was particularly interested in an extremely rare and much-sought-after recording by a singer named Arthur, last name unknown. This Arthur apparently had recorded his one-sided LP at a label called Two:Dot in 1969. But no one had ever heard of Two:Dot. Eventually, Dumont’s research led him to Dean Thompson. He placed an overseas call to Santa Barbara. “But Dean did not remember Arthur,” Dumont says. Some time later, Dumont called again to ask more questions, only to find that Dean had died, and that JoAnne did not remember Arthur either. “It’s a great record,” says Dumont, who tried in vain to find Akins so he could reissue her album too. But Akins now had a different name, Sue Randall, and she had left the music business behind many years before. She was difficult to locate, and completely unaware of the renewed interest in her old album. “I never found her,” Dumont says. Three factors drove the collectors’ fascination with Two:Dot. First, scarcity. Two:Dot generally printed albums in tiny lots: 50 copies, 100 copies, perhaps 200 copies. Four decades later, how many could possibly be left? Second, sound quality. For a tiny studio out in the boondocks, Two:Dot maintained very high technical standards. And Two:Dot of course used analog equipment, which later was rendered obsolete by the digital revolution. Many audiophiles nowadays revile the sound of digital recordings and thrill to the sound of a well-made analog album, including those cut at Two:Dot. Next it was finally the turn of “Hendrickson Road House,” the collectors’ favorite. Sue Randall was living in Oregon, still unaware of the intense interest in her old Two:Dot album. In June 2010, someone finally tracked her down and clued her in. A year later, “Hendrickson Road House” came out on CD, on the British label Wooden Hill. It contained some never-before-heard bonus tracks, most of them recorded on Hendrickson Road and preserved for decades in acetate form by the former Two:Dot technician Don de Brauwere, who remastered them and gave them to Randall for the reissue. Hendrickson Road long ago was paved all the way to its end, so these days the uphill drive to the former Two:Dot site is a smooth one. The garage has gone back to being a garage, and is notable only for the presence of Darrell Jones’s lovingly restored 1947 Dodge sedan. Glenda has converted Dean Thompson’s former control room into an exercise room, and the only audio equipment it contains is her Bose CD-radio player. JoAnne Thompson still lives in Santa Barbara, in a lovely home overlooking the ocean. Still very active at 83, she gives voice lessons, sometimes recording her students on a machine in her living room — a nice Two:Dot touch. Ojai still boasts a lively music scene, along with a couple of spiffy recording studios. (The popular indie rock band Edward Sharpe and the Magnetic Zeroes spent several months in the valley in 2011-2012 cutting their hit album “Here.”) Alan Thornhill plays at the Ranch House on Friday nights, and Milton Kelley has a regular gig at the Deer Lodge. Martin Young recently moved back to Ojai after many years as a big-time professional guitarist based in Nashville, and he often joins his old friends on stage. Few of their listeners realize it, but whenever Thornhill and Young play an old Country Z Men favorite, or whenever Kelley and Young play “Hard Way to Die” from “Home Brew,” they are offering a tribute of sorts to their Two:Dot days. Young says he might look into the possibility of releasing those old Country Z Men demo tracks, “if we can find a decent copy.” Another intriguing possibility would be the demo he cut with Dan Protheroe, Jim Hendricks and Van Dyke Parks — if he can find any copy at all. “I’d give my left arm to have that recording now,” he says wistfully. Is there anything else from the Two:Dot vault that is waiting to be rediscovered? Jeff Hanson doubts it. Not since Dean Thompson threw out all the unclaimed master tapes when he liquidated the studio’s inventory. But how can he be sure? Who knows when another Arthur Gee might come forward, a forgotten hippie troubadour clutching the only remaining copy of an old Two:Dot demo? Or perhaps that mysterious Englishman John Jones will one day re-emerge from oblivion clutching the tapes of his Two:Dot session, now hailed by collectors as a long-lost psych-folk masterpiece. Dean Thompson’s studio was open to all comers, without filters, at a time when a great many people sincerely believed that rock music had the power to save the world. Some of those who recorded there hoped to sign with a major label and win fame and fortune. Others just wanted to testify; to add their voices to the heavenly choir. They sang their piece, paid for their records and went away. And life went on, and rock music did not, after all, usher in the millennium, and those records ended up stashed in a box in an attic and forgotten. Some are still there. The Two:Dot catalog — whatever is left of it — beautifully documents this process as it unfolded here in Ojai, where the millennial impulse has always been strongly felt. No wonder collectors are drawn to these records. They offer the pure, unvarnished sound of the Sixties moment, lovingly preserved on vinyl, still waiting to be heard. Originally published in the Summer 2012 edition of the Ojai Quarterly. 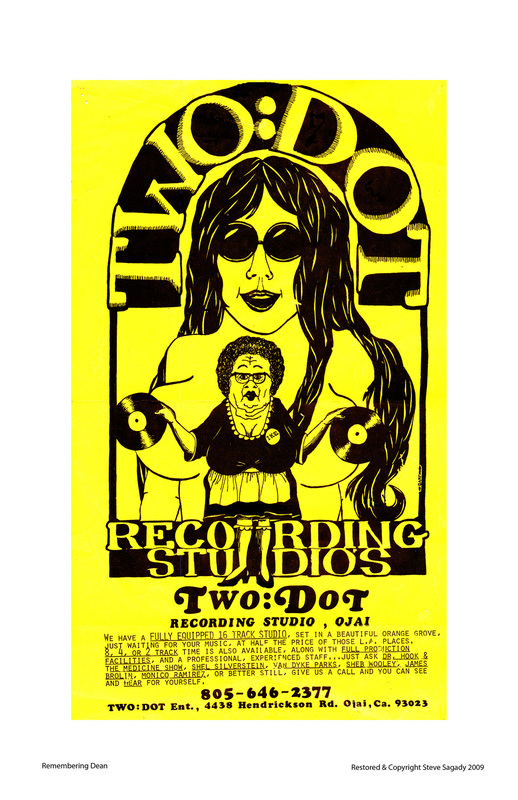 I did a lot of recording at two dot in the 70s.Great studio. Dean was great to work with & really knew his stuff. i still have the reel to reel tapes i recorded there. Nice to be able to share this.